So here's not one, but two hardware refreshes. Yep, two models, one bigger than the other (sound familiar? ), both of which arrive with new buttons, a second (gasp!) analog stick and some new 3D screen assistance that means I now willingly switch on the 3D effect while playing games. Whoa. For now, it's launched in Japan and parts of Asia, and it's also coming soon to Australia and New Zealand. I'd bet the cost of a new 3DS that it'll make its way to the rest of the world at some point; it's just a matter of when. This is the New 3DS and New 3DS LL, and if you already have an older model, you'll probably want to consider an upgrade. Both of the new 3DSes bring enough improvements to warrant an upgrade from the original system. 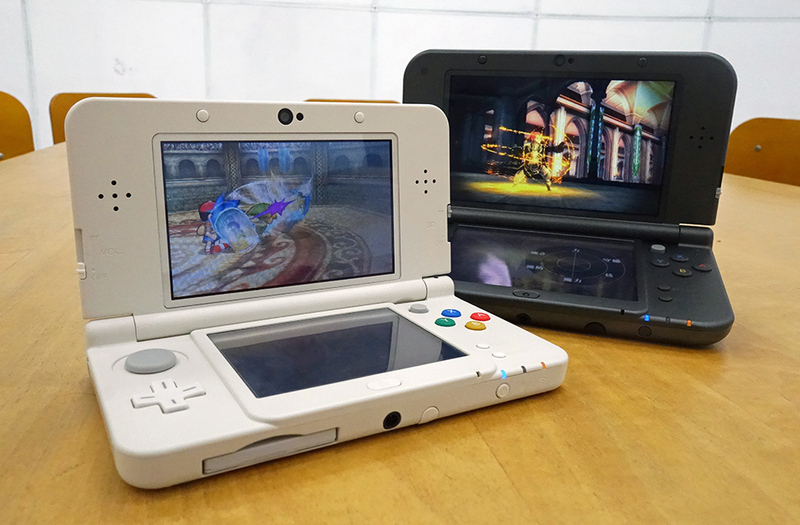 Nintendo has finally managed to make the 3D effect work comfortably, and hardware looks more refined on both models. 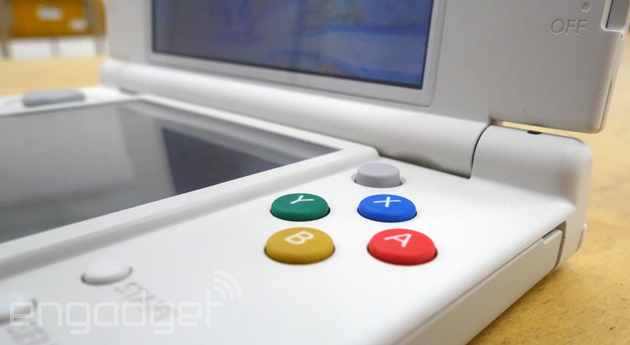 If you already own a 3DS, an upgrade in 2015 is a wise decision. 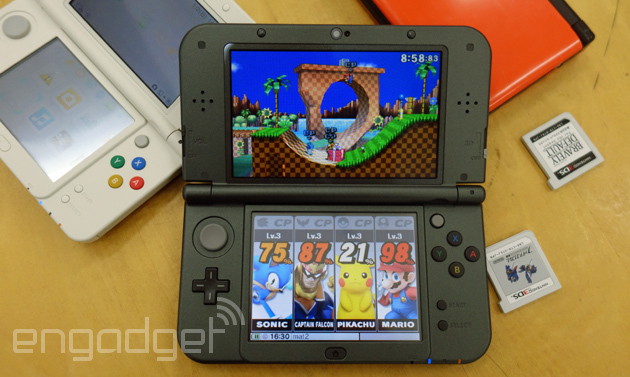 How would you rate the New 3DS? Both of the handhelds have new buttons and new controls, and they're all changes for the better. Nintendo's added secondary trigger keys (ZL and ZR, respectively), both of which lie on the inside edge of the primary L and R trigger buttons. The new triggers are about half the size, but they should open up more sophisticated control settings for games, if makers are willing to configure for the two new consoles. (Ah, there's that caveat.) The start and select buttons on the 3DSes are now underneath the colored action buttons, with a single Home button underneath the secondary touchscreen display. It looks classier and more streamlined than the row of relatively chintzy-looking buttons (Home, Select and Start) on the original 3DS XL. Importantly, then, there's that new analog nub. I'm not going to call it an analog stick, because it's most certainly a nub, inspired by the yellow-hued protrusion found on the GameCube's controller (RIP), but it's not quite as handy. I'm not completely sold on its ability to do anything dynamic (say in Smash Bros., where you can unleash those all-important knockouts), but it does work. Better still, it's a more than capable camera control in (compatible!) games like Monster Hunter 4G and should, importantly, take the weight off assigning excessively fiddly button combinations to offer similar functions. Nintendo appears to be trying to ensure it's compatible with any game that's used that peripheral curio, the Circle Pad Pro, although that doesn't quite work the other way around. The aforementioned Nintendo beat-em-up isn't compatible with the Circle Pad Pro, so if you want a second stick, you're gonna have to pay up for one of these new 3DSes. For me, it's the changes Nintendo has made to the 3D screen (or at least how it works) that make these new consoles a substantial improvement over their predecessors. In case you've forgotten (or you keep the 3D mode turned off like I typically did), there was only a very narrow sweet spot for playing games in pop-up 3D. Tilt your head a little, lean back too far or (heaven forbid) try some gyroscopic controls and it disappears, the Magic Eye effect broken. This time, Nintendo's new "super-stable 3D" monitors where your head is (there's even a twee little animated head when you first set up the function that tracks your movement). Nintendo added an infrared LED, nestled next to the front-facing camera, to help track in less than ideal lighting. Thanks to this, there's no longer any weird, flickering double image -- at least it's a rare occurrence when playing. All told, there's no shuttering and the 3D is simply much more comfortable and feels less rigid. I get less tired; I don't get headaches with this one. My theory is that because you've now got some wiggle room while you play on the new machine, your eyes (or brain, I'm no doctor) can relax into it. The screens are otherwise similarly bright... and similarly low-res compared to your smartphone. With the New 3DS LL, the black model has a slight granite sparkle on the interior, something not found on the older 3DS XL, while the New 3DS we tested had a nice matte white finish, with SNES-themed colored input buttons. It's a nice touch and combined with the optional, customizable plates, it pushes the smaller model into the lead, at least aesthetically. Unfortunately, the bigger model (and yes, I still otherwise swear by that larger screen), doesn't get the chance to dress up. For the New 3DS, covers cost between 1,000 and 3,000 yen ($9-$30), with the top price getting you a fancy Pokémon fabric casing and other luxurious options, like metallic and even wood finishes. The panels are attached by screws and you'll also need a screwdriver to access the removable battery and the microSD card slot. Given the curious way Nintendo deals with SD storage for the 3DS (you can only use one card on one machine), it makes sense to have it here. You're unlikely to have to unscrew the panel once you've upgraded from the default 4GB card that comes inside the device. 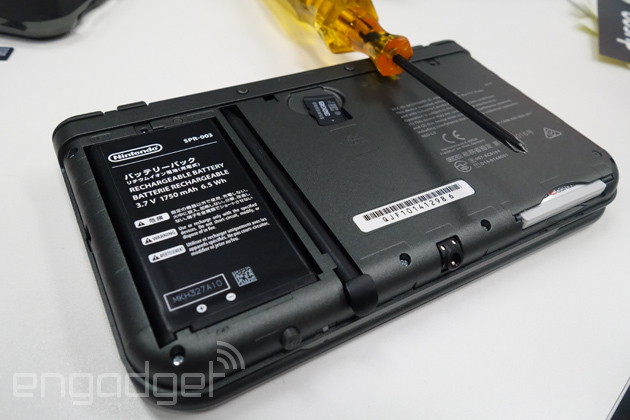 When it comes to power, our testing so far nets a power-drain pretty similar to 2012's 3DS XL: Full-tilt mode (full brightness, 3D mode, roughly an hour of online gaming) will sap the new 3DS LL's battery in around four hours. When I went more sparingly with the brightness and switched on the power-saving mode, I squeezed out close to nine hours of playtime. Switch to simpler original DS games and you'll see even better mileage. This may be new hardware, but it's the same software running inside the clamshell portable. Nintendo was sharp enough to bring a recent update to all its 3DS models, adding customizable home screen themes and generally tidying up of the console's menus and options. Otherwise, not much has changed here. You can feel the benefits of a hardier processor when shopping for games online and downloading them, but this is by no means a smartphone or a tablet. Try using the built-in browser, and generally despair. 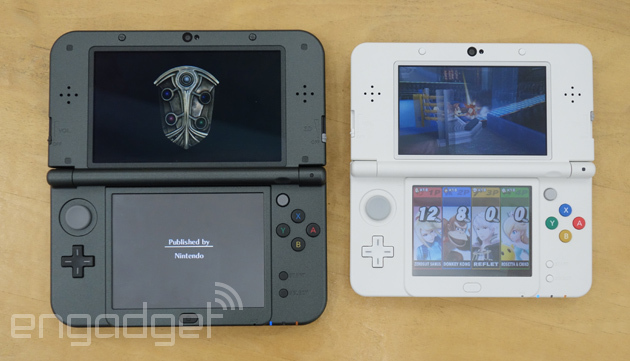 You'll have all the Street Pass sharing and game features found on other 3DSes (and explained in our original review). Buying games online has been sped up a little, but it's still pretty darn laborious. Again, the processor sped up nearly all tasks compared to the existing 3DS consoles -- on both the New 3DS and the New 3DS LL. My main reason for recommending the system right now, or at least when it launches in the US and Europe sometime next year, is that the 3D effect is no longer a chore: Things still pop out, but now it doesn't make my eyes sore. As I said at the start, I'm now willingly turning on the 3D effect with these new devices -- something I hardly ever did with either the original or the XL model. 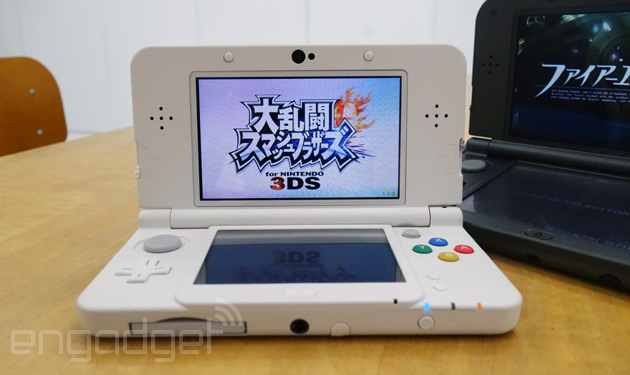 And isn't that effect half the point of a 3DS?